© 1965 United Feature Syndicate Inc.
"It's Your 50th Christmas, Charlie Brown," a one-hour musical salute to the award-winning cartoon, debuts at 7 p.m. Monday, Nov. 30, on WKRN-Channel 2 (ABC), followed at 8 p.m. by the TV classic, "A Charlie Brown Christmas." Both will rerun at 8 p.m. Christmas Eve. TV Christmas specials by the multitude have come and gone for over a half a century, but one stands out as most special to me and, I am sure, to millions of other baby boomers. That would be "A Charlie Brown Christmas," a holiday classic that celebrates its 50th anniversary this December. You cannot intentionally create a "classic." It must prove itself by the test of time. This 25-minute animation, the first-ever "Peanuts" special, has accomplished that. It ranks as the second-longest-running holiday special on TV, right behind "Rudolph the Red Nosed Reindeer," which premiered one year earlier. Astonishingly, this Emmy and Peabody award-winning cartoon, made for a mere $96,000, almost did not make it on the air. The plot was not complicated. Charlie Brown and his pals discover the true meaning of Christmas while working on a school play and decorating a sickly fir tree. Linus saves the day with his recitation of the birth of the Christ child from the book of Luke. "Peanuts" comic-strip creator Charles Schulz and his production crew, guided by producer Lee Mendelson and director Bill Melendez, believed they had made a dud. Besides that, CBS network executives hated it, complaining of its slow pace and simple animation. They gave it black marks because it had no adult voices and no laugh tracks. The bigwigs of the powerful commercial network did not approve of the anti-commercialism message. They also did not like the sound of Vince Guaraldi's magnificent jazzy score, itself a classic. But the gripe at the top of their list? Well, at the heart of the matter was the gospel truth. "A Charlie Brown Christmas" debuted at 6:30 p.m. Thursday, Dec. 9, 1965, and was viewed by 45 percent of those watching television that evening, with an estimated 16 million homes tuned in. Besides the quality of the script, music and message, the cartoon remains my Christmas favorite for nostalgic reasons. That December, when I was 13, my parents, four siblings and I were living with my country grandparents, who still had five children residing in their three-bedroom house in Readyville, Tennessee (population 100). We slept in every room in the house but for the kitchen and bathroom. My brother and I shared a bunk in the den, while two uncles, one of them about ready to ship out to Vietnam, slept in another bed. That Thursday December evening, after one of my grandma's incredible suppers (I cannot remember the main course but can guarantee there would have been heaping plates of hot, homemade biscuits), a dozen or so of us scrunched in the den, and there, on a black-and-white TV set, we enjoyed the inaugural "Peanuts" special, which by the way was commissioned by Coca-Cola. This was also a remarkable, memorable treat because in those days only Saturday mornings were reserved for children's shows, thus a cartoon on a prime-time weeknight proved rare indeed. I don't believe I'll spoil anything by sharing the story, but feel free to stop reading if you have never watched "A Charlie Brown Christmas," and shame on you if you have not. The cartoon commences with children warbling, "Christmas time is here, happiness and cheer, time for all that children call their favorite time of year." Good ole Charlie Brown confides to his friend, "I think there must be something wrong with me, Linus. Christmas is coming, but I'm not happy. I don't feel the way I'm supposed to feel. ... I always end up feeling depressed." 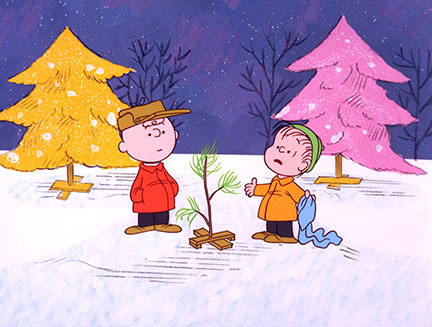 After Charlie Brown confides to Lucy, she suggests he direct the Christmas play. Next he catches Snoopy decorating his doghouse with Christmas lights and ornaments, an exercise inspired by a flyer that notes "find the true meaning of Christmas. . . . money, money, money," via a neighborhood lights and display contest. If that weren't enough to send him into a tizzy, he happens upon his sister Sally, who begs him to write a letter to Santa. The bottom line of her sentiments? Just send money. Charlie Brown proceeds to the auditorium where he will direct the play, and we spy a funky, delightful moment with the Peanuts kids dancing on stage to the music of Schroder on piano, Snoopy on guitar and Pigpen on bass. As things turn ugly during the rehearsal, Charlie Brown reasons that they need a Christmas tree, so he and Linus amble to a corner lot bursting with artificial trees, and our Everyman selects the sole living tree, a pitiful fir with three branches. Toting the tree back to the stage, the sentimental youth is heckled, the scraggly sprout is mocked, and the gang labels Charlie Brown as "hopeless." He cries out, "Isn't there anyone who knows what Christmas is all about?" And then Linus speaks up: "Sure, Charlie Brown, I can tell you what Christmas is all about." Security blanket in hand, Linus walks to center stage and quotes the Gospel of Luke chapter two, verses 8-14 from the King James Version. "That is what Christmas is all about, Charlie Brown," says the lad. Charlie Brown takes the woeful tree outdoors and beneath a starry sky looks heavenward and confesses, "Linus is right." Snagging a single ornament off of Snoopy's doghouse, he places it on the tree and it tips over. "I've killed it," mourns our hero. Then wise man Linus wraps his blanket around the bottom of the tree and says, "Maybe it just needs a little love." The other children remove ornaments from the doghouse and decorate the tree, and, presto-change-o, it glistens like a diamond. The story closes as the children harmonize on "Hark! The Herald Angels Sing." No "Good grief!" at the end, just the silent recognition of good grace, God's grace, through the gift of his infant son, Christ the Lord, the greatest miracle of them all.